possibility of new allocation changes. TAKING A THREE WEEK VACATION ... We will be on a three week (and much needed) vacation from August 8-26. Newsletters will not be published August 11, 18, 25. We will resume newsletters on September 1. Markets will be monitored, as usual, and if there is a change in market conditions, we will issue a corresponding trade alert. We will not be answering emails during this period. Thank you for your great support and understanding! Below is our most recent interpretation of the S&P 500 Index (Aug 5). As you can see, there is a strong possibility the market could rally back to the 50-dma once the downside target of the head and shoulder formation has been reached. However, getting cute is not our job. We believe it is best to stay in cash. In fact, we got a new and very rare Dow Theory Primary Trend Sell Signal Thursday, as the Industrials confirmed new closing lower lows by the Trannies after failing to confirm the Trannies new higher high in July. Both Trannies and the Industrials closed below their March 2011 lows. This confirms we may be entering the next Great Depression. Meaning, this market will probably go down a lot harder than this first major sell-off. Markets are confirming that the next Great Depression is on schedule and may last for a while. We may find support and a tradable rally sometime in mid-Sept (see chart), though this may not be the end -- stay tuned. The next Newsletter will be released on September 1. The F Fund is modeled by the bond fund AGG. Last week we wrote, "... the bond fund seems to be in the process of forming a bullish flag pattern as it consolidates in a very tight range between 107.3 to 107.8. ... I am favoring an upside resolution due to the pattern." This was the correct interpretation for AGG. The bond fund broke out of its zone of consolidation, which was under accumulation. We can not allocate any of our TSP into the F Fund for two reasons: (1) The upside potential from current levels is probably limited. (2) We have already used up two signal changes for August. The next time we can trade is in September. The C Fund is modeled by the S&P 500 Index ($SPX). Our technical interpretation of the S&P 500 index continues to be in sync with the dynamics of the market. Let's review the market from both a fundamental and technical perspective. (1) S&P Index Traces Out Head-and-Shoulders Top Formation -- The chart below shows the pattern extending the entire year (2011). In fact, 2011 has been one big consolidation with little movement in the index. As members were alerted last week, we believed this zone of consolidation had potential of being a large distribution pattern. SPX finally broke below neckline support, which confirmed the reversal formation. A break projects further weakness towards the next support zone in the 1175 area. This area compliments the target of a H&S inverse formation. To find the target level, we first find the distance from the top of the head (1365) to neckline (1265), which equals ~100 points. This value is subtracted from the neckline breakdown value of 1265, which equals 1165. The target of the H&S inverse formation (1165) is just a small percentage away from the support zone value of 1175. (2) S&P Index Approaches Long-Term Support -- As shown in the chart below, SPX is rapidly declining in price. Based on the chart, potential trend support will be reached around 1190-1200. This is slightly higher in price than the target based on the head-and-shoulders formation. So things should get more interesting around these levels. (3) RSI Forms Bearish Failure Swing on SPX Weekly Chart -- Turning to the current S&P 500 chart, we can see a consolidation extending throughout 2011. Support is at 1250 and resistance at 1371 (range = 8.8%). With a sharp decline over the last two weeks, the index is down over 7% and breaking the 2011 lows this week. Even though this pattern is shorter than the prior two, in both time and length, we cannot ignore this topping process or the current support break. Turning to RSI, the indicator formed a lower high in April and failed to exceed 70. According to Wells Wilder, creator of RSI, a Bearish Failure Swing occurs when RSI moves above 70, dips below 70 and then fails to exceed 70 on the next bounce. The Bearish Failure Swing is confirmed with a break below the prior low in RSI. There is also a bearish divergence as the indicator formed a lower high while the index forged a higher high. RSI has since moved back into its support zone (40-50). A break below 40 would provide the final piece of the bearish puzzle. Expanding Triangle Targets New Highs -- Just like economists, Elliott Wave is famous for its alternative counts. The chart below shows the possibility of an ABCDE expanding triangle. Waves A, B and C are done deals. The move from the March 2009 lows signaled the start of Wave D with an upside target above 1500. Each wave within these patterns typically subdivides into three waves, which gives it a 3-3-3-3-3 structure. However, it is often hard to find just three waves within each wave. Should an ABC structure evolve now, the current Wave D would be within Wave C of an ABC advance. Once completed, we can expect a reversal around 1500 and a move back towards the lows for Wave E. Frankly, this sort of broadening pattern appears to fit with the times right now. Bubbles push to new highs and then these bubbles deflate quite quickly. As the chart now stands, Waves A, B, C and D have gained or lost more than 45% each (as stated in the table below). That is four substantial moves in the last 10 years. Despite four big moves, the S&P 500 is still trading below its 2000 peak. Bear cycle -- Aug '00 to Sept '02, the S&P declined 46%. Bull cycle -- Sept '02 to Oct '07, the S&P increased 90%. Bear cycle -- Oct '07 to Mar '09, the S&P declined 53%. Bull cycle -- Mar '09 to present, the S&P increased 105%. The S Fund is modeled by the Dow Jones Wilshire 4500 Completion Index ($EMW). EMW is now trading below its 50- and 200-dma's. The fund is trading near long-term support that goes back to July '09. However, based on the potential head-and-shoulders formation, our target is at about 595. The distance from the head to neckline is about 65 points. Subtracting 65 from the breakdown price of 660, gives a target of 595. This value is very close to the lows of Nov '10. If this level is approached, then the stock will break below long-term support. We remain bearish in the S Fund. The I Fund is modeled by the EAFE Index iShares (EFA). EFA has now broke below its 50- and 200-dma's. Last week we wrote, "It is a must that the 200-dma and then the lows of June hold if we are to remain bullish. 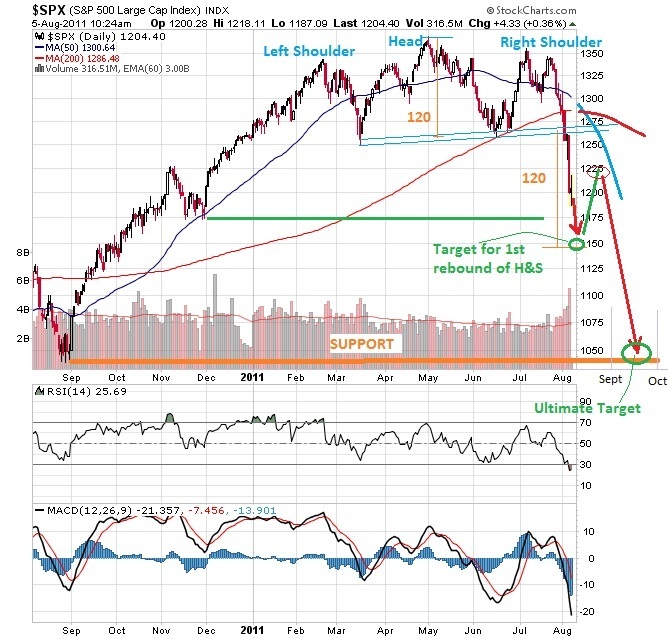 If these levels are broken to the downside, it is mandatory we become bearish." Both of these levels did not hold, and now we are in the stable G Fund to preserve capital during these volatile times. Based on the chart below, the next levels of support are the lows of Nov '10 and Mar '11 between 52.5-54. If these do not hold, then the stock has potential for a massive slide to ~48. We have already used up two trades for August. So the next time we can make an IFT is in early-September. about our service to government employees (active and retired). Thank you! If you truly like our analysis, a small Donation to the Editor is a great way of saying "Thank You!" For a complete list of all fund allocation changes, please go to Our Returns page. Copyright © 2005-2011 TSPFundTrading.com, LLC (a division of TSP Financial Investment Strategies, LLC). All Rights Reserved.